a Christmas tree, or form into shapes to make holiday ornaments. 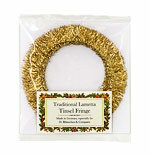 Our classic Lametta tinsel trims are authentic treats from the past! Manufactured in the traditional manner on antique machines that are more than 100 years old, these metallic Lametta tinsel trims are made just for us by a family firm that was founded in 1885. 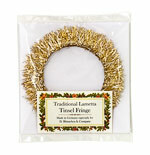 What is Wired Tinsel Fringe? Genuine strands of Leonische "Lahn," which are fine, flattened metal filaments, are woven through twisted wires that runs along one side of the fringe. 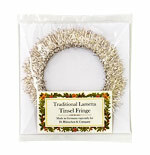 This wired edge allows the tinsel fringe to hold its shape in any design. 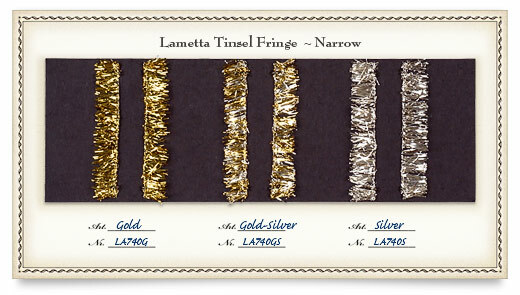 A Note about Lametta "Lahn"
This tinsel fringe is made from real German metal "Lahn," which is prized by artisans and decorators for its old-fashioned qualities. 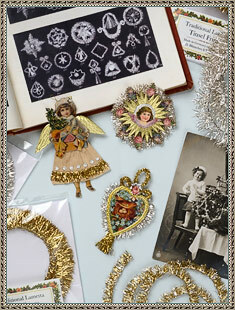 The metallic strands are somewhat delicate and will matt down with use, but this just adds to its authentic Victorian charm! Also, all of the gold-tone and fancy color plated tinsel trims will darken with time, while all the real silver plated tinsel is "guaranteed to tarnish." 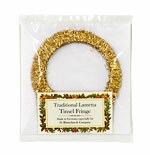 Our narrow tinsel fringe is perfect for creating smaller-size holiday ornaments and decorations. Easy to form into any desired shape, or cut into small sections to use as glittery decorative accents in corsages, bouquets and wreaths. 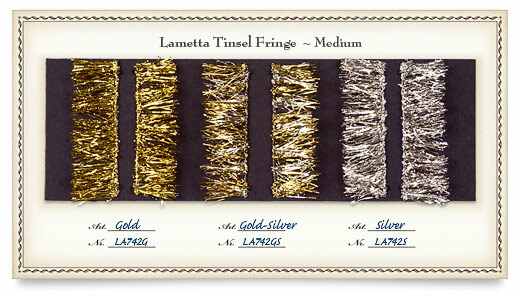 one piece of 3' long, metallic Lametta tinsel wired fringe. This medium width tinsel fringe is our most popular size for holiday ornament crafting. It's a cinch to shape into a round halo, or cut small lengths and roll tightly along the wired edge to create fluffy tinsel puffs, or flatten into fans.